Preheat a large skillet over medium heat, add sesame oil and ground turkey. Break it up after about 4-6 minutes of cooking. Add green onions, carrots, edamame, the chopped garlic, and onions. Cook for 6 to 8 minutes or until the turkey turns white and the onions are getting translucent. Pour into the skillet the chicken broth, soy sauce, vinegar, hoisin sauce, and sriracha. Mix well so that everything coats evenly. Boil the sauce and then, turn heat to low and simmer for 4-6 minutes until thicker. 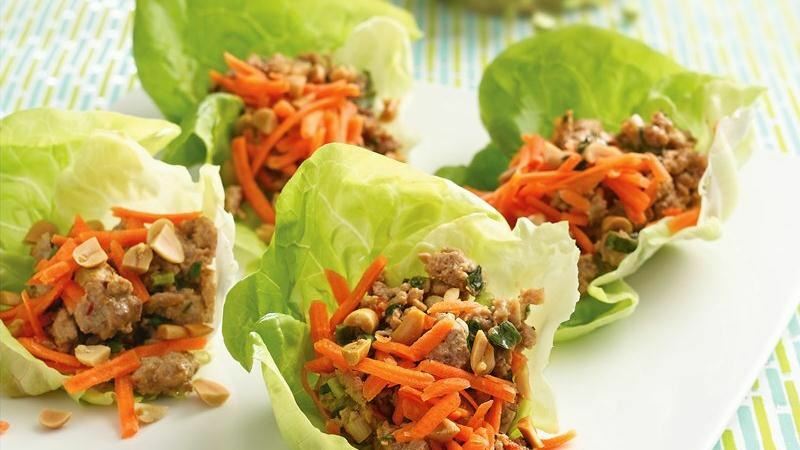 Add ¼ cup of filling in each lettuce leaf.